We’re celebrating Sheena Week by providing you with a bunch of amazing technique tutorials so you can get the most out of your fabulous Sheena Douglass products! 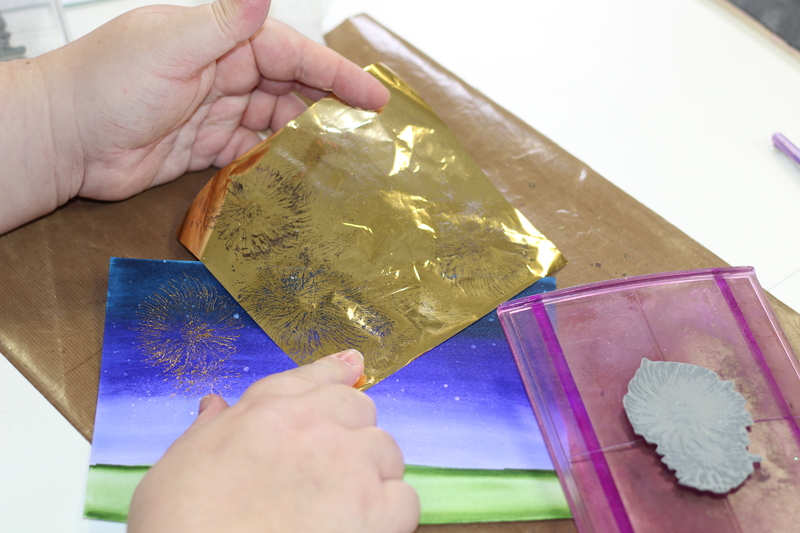 Today we’re sharing a technique using Pebeo foils and Mixtion paste to help you create stunning effects with your Sheena Douglass stamps! 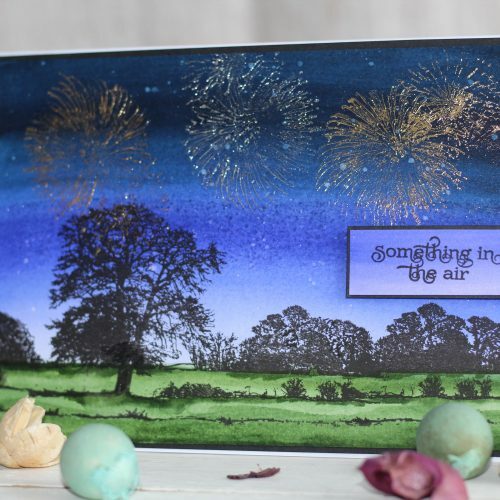 with an A5 peice of Sheena Stamping Card and your Night Sky and Majestic Purple sparkle pens, create a wash background starting with Night Sky at the top of your card then the Magestic Purple down to around 1.5 inches from the bottom of the card. Dry off with a heat gun. 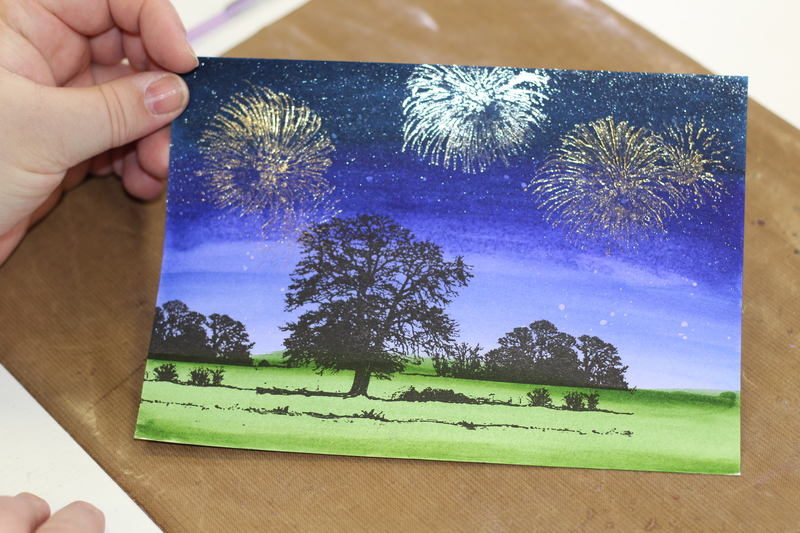 Then, take the Forest Walk sparkle pen and draw a ‘horizon’ along the point where the colours ended. Wash the colour all the way to the bottom of the card. 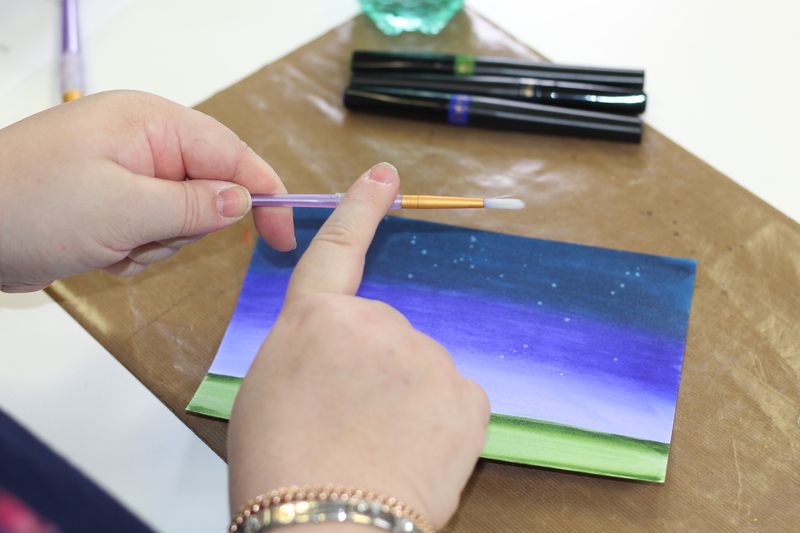 Next, make the starry sky by wetting a small paintbrush. Hold with one hand and tap the end of the brush lightly so that tiny droplets of water hit the card. Allow it to settle for a few seconds then blot with a piece of kitchen paper. Repear a necessary. 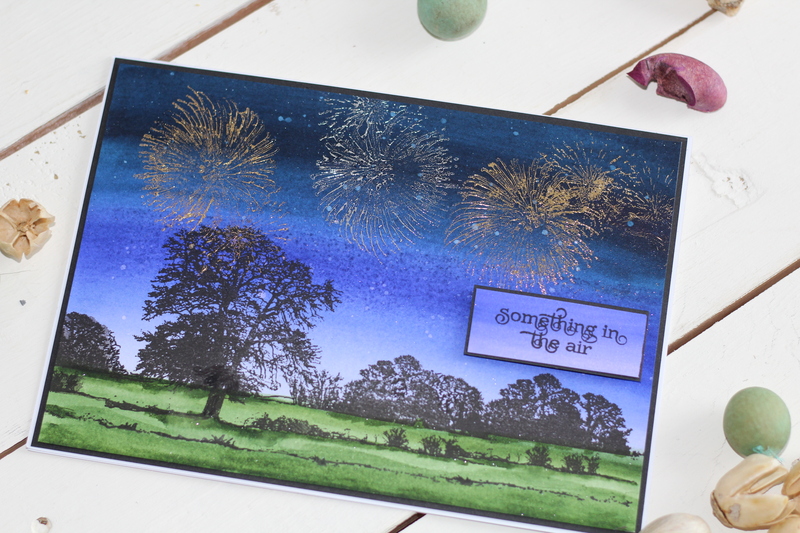 Take the firework stamp from the ‘Something in the Air’ set, spray the back with stick and spray then adhere to your rock-a-block. 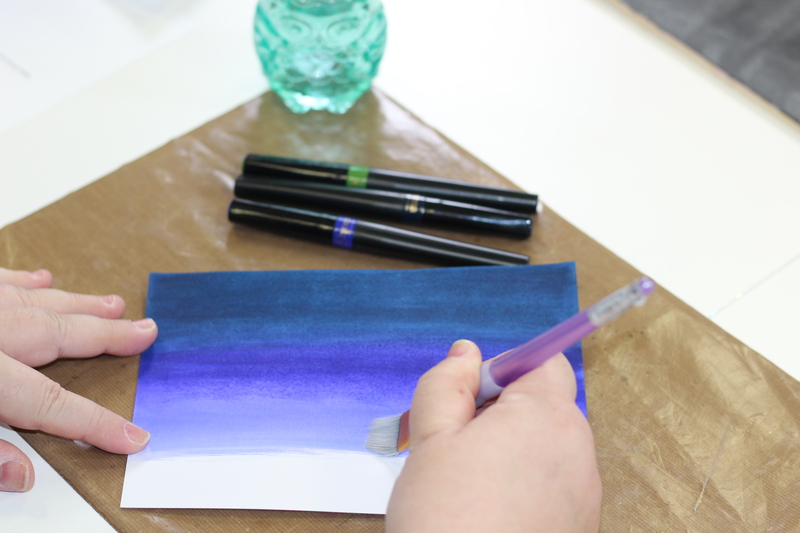 Squeeze a bean sized blob of Mixtion paste onto your craft mat. Flatten the paste with your finger and add it to your stamp. Press the stamp into the sky of our image then remove it – repeat 3 times. The Mixtion is white and turns clear when ready for the foil. Apply the foil, shiny side up onto the stamped paste, rub then pull away. Note – If you aren’y cleaning your stamp straight away, you must brush some water onto it to shop the Mixtion drying and ruin your stamp. 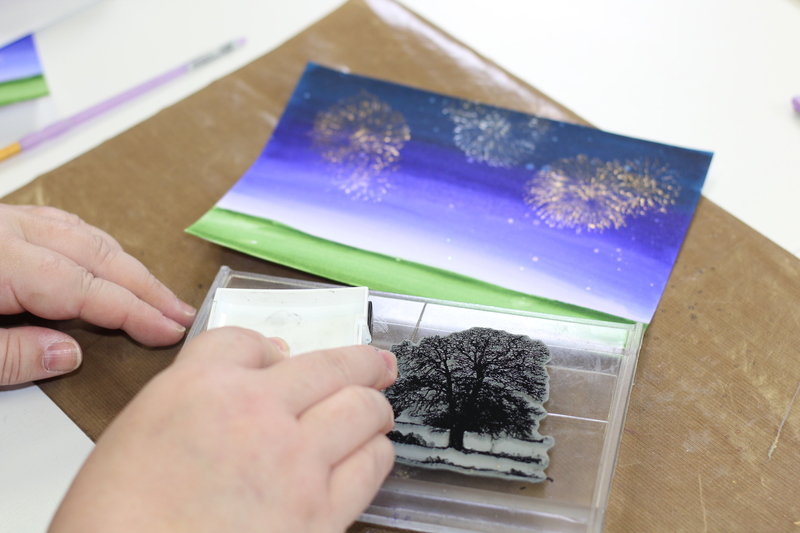 You also need to give your brush a good wash.
Take the tree stamp from the ‘Looking Up’ stamp set and stick to rock a block. Ink carefully with your Versafine Ink then stamp onto the grass part of your image. Clean your stamp then re-ink the small trees only, then continue to extend your image. Use your green sparkle pen again to add shadows underneath the trees. Trim your card edges and mount your scene onto black card, then mount again onto an A5 card base. Stamp your sentiment, mount onto black card and use a foam pad to stick it in place. We’d love to see your makes when you give this a try! For more fab Sheena products check out the exclusive offers on sale now!